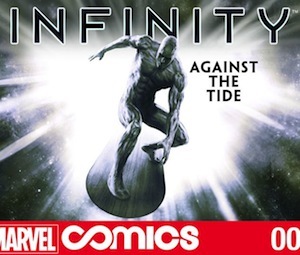 Marvel’s latest Infinite comic kicks off it’s new crossover Infinity in the same way Nova did for Avengers vs. X-Men last year. But how does this latest offering match up now there are even more Infinite books available? Following in the footsteps of last year’s Avengers vs. X-Men: Nova, Marvel‘s latest Infinite comic is a prologue to the all new Infinity crossover and sees the Silver Surfer attempting to save a planet of skrulls from an invading force known as The Builders. With the obvious association between the Surfer and Galactus this is not as welcome as the surfer might want it to be and his arrival is heralded with suspicion and fear. Unlike Avengers vs. X-Men: Nova which was the first Infinite comic and heralded an exciting new age for digital comics, Infinity: Against The Tide is released into a universe which already features the aforementioned AvsX, the Guardians of the Galaxy one-shots and Wolverine: Japan’s Most Wanted Infinite comics and so suffers in comparison. The story is slightly lacklustre, especially without the context of the rest of the series – which is a surprise from Jason Latour who is doing such sterling work on Wolverine – and despite some stunning painting artwork from Agustin Alessio, which is reminscent of Alex Ross (although not quite as accomplished), there is very little in this issue to help it stand out from the pack. It is essentially just a series of flat panels with a couple of minor effects. Not every digital comic has to reinvent the wheel and create something entirely new, however with so many visual tricks at the artists’ disposal and with this still being such a new and exciting medium to work in, this seems like a missed opportunity. Conspicuous by their absence in this issue is layout artist Yves Bigerel who has been so instrumental in creating the look and feel of Guided View comics, and clearly is the driving force for Marvel’s creativity when it comes to Infinite books.